Chief Andrew Carpenter has been an active member of Glen Cove EMS since 2008 and a member of Glen Cove EMS Explorer Post 1072 from 2004-2008. Chief Carpenter was elected Lieutenant in 2012 & 2013, Captain in 2014 & 2015 and Second Assistant Chief in 2016 & 2017. 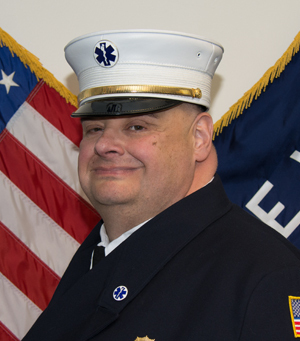 Chief Carpenter became a New York State Certified First Responder in 2008, a New York State Emergency Medical Technician in 2009, and has been a New York State Emergency Medical Technician Critical Care since the Spring of 2011. Chief Carpenter is also a Volunteer Firefighter with the City of Glen Cove Volunteer Fire Department. 1st Assistant Chief Thomas Ustler has been an active member since 2002. Chief Ustler was elected Treasurer, then Lieutenant, Captain, and was elected as 1st Assistant Chief in 2016. Chief Ustler started his life in EMS in 1985, as an EMT and is currently a NYS Certified Paramedic. He has worked for the NYC 911 system, North Shore EMS and has volunteered with Brentwood, Laurens and Copiague EMS. Chief Ustler is involved in the Glen Cove Volunteer EMS Explorer Post 1072 and has had the pleasure of watching some of the current officers start their careers in the EMS Explorer Post, and now have grown into today's leaders. 2nd Assistant Chief Michael Brodnansky has been an active member of Glen Cove EMS since 2013, Lieutenant in 2016, and Captain in 2017.